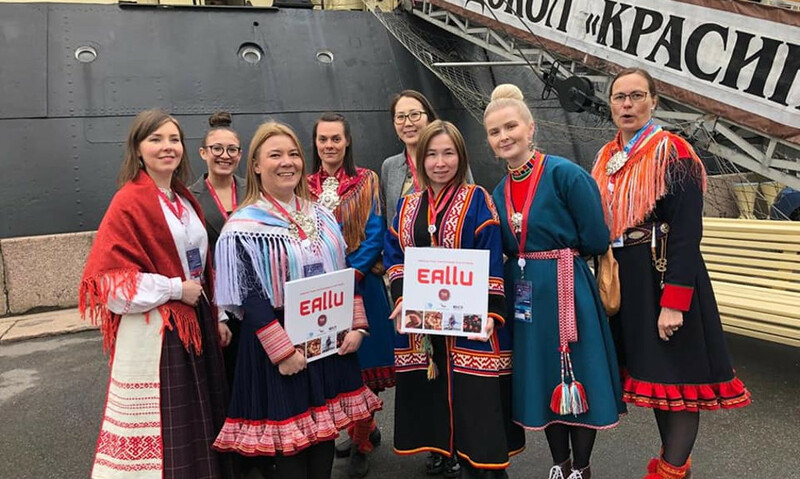 The exhibition prepared on the materials of the project “EALLU: Arctic Youth, Climate Change and Food Culture” was opened on board of the icebreaker “Krasin”. The temporary exhibition became part of the cultural program of the V International Arctic forum “Arctic — Territory of Dialogue”. The president of the Association of World Reindeer Herders Sergey Kharyuchi and young residents of Yamal – the co-authors of the book participated in the opening of the event. The participants of the project and the authors of the book of the same name presented culinary masterpieces of peoples of the Arctic and diverse modern food culture of people living in the Arctic to the guests of the exhibition. EALLU from the northern Sami language is translated as “deer herd”. The book with this name received the first prize and was recognized as the best cookbook of 2018 at the International culinary award “Gourmand World Awards”. Recipes of the Arctic are the source of life, deep philosophy and culture, historical legacy of the world and expression of the great harmony of relations between nature and human. Traditional knowledge about the ways of food getting, cooking and processing, about the environment allowed reindeer herders, hunters, fishermen and gatherers to support life of people and animals for thousands of years. According to the information given to the news agency “Sever-Press” in the representational office of Yamal in Saint Petersburg, the participants of the project EALLU managed to bring together traditional knowledge and skills of 14 indigenous peoples of the Arctic living on the coast of the Arctic Ocean. The exhibition is also presenting items from the collection of the branch of the All-Russian public organization “The Russian Association of indigenous peoples of the North, Siberia and the Far East” in Saint Petersburg and Leningrad region, funds of the Museum — icebreaker “Krasin”. They tell about peoples of the Arctic, their traditional way of life and culture of attitude to animals and the surrounding world. The exhibition was prepared with support of the Arctic Council, the Association of World Reindeer Herders and the Committee of Saint Petersburg on Arctic Affairs. Residents and guests of the northern capital will be able to visit it within the opening hours of the Museum till the 10th of May.